Allergies can attack anyone, anywhere at any given time. It is a hypersensitive reaction of the body that comes in contact with an allergen. An allergen can be found in food, drinks, and environment. Studies have shown that most allergens are harmless meaning only a small percentage is only affected by it. When I was a baby and during my growing up years, my mother always utters the information that I had asthma when I was a baby and eventually outgrown it. I had it from my father's side health history. I cannot remember an incident that asthma took a hold of my daily life as a kid to adulthood. But, taken that I have in me I always think that anytime it can be triggered symptoms will definitely occur, even for a simple allergy attack. As a health practitioner, I always treat allergies based on what I have learned. I rely on medicine for the most common type of allergies as my first-aid intervention at work. And as a Mom, I try to manage it using herbal medications I have at home. Apple cider vinegar, honey, and eucalyptus oil are my basics for home remedy hacks. 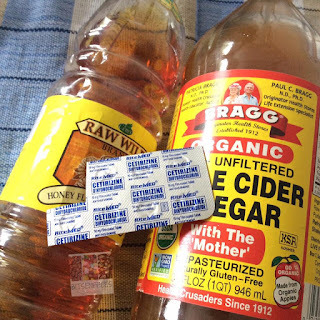 A mixture of honey and ACV as a concoction helps a lot. Natural agents from a natural source can decrease pain and allergy reactions. It has been well known that aiding an ailment using from natural sources has been practices since the olden times. Lastly, when things come to worse I never set aside to resort to anti-histamine drugs I also have in my medicine cabinet. To prevent further damage like an anaphylactic shock when allergies are not treated right away or neglected for some reason, always consult with medical specialists like Premier Allergy Doctors, like Dr. Summit Shah based in Columbus, Ohio. I remember the last allergy attack I had was when I first ate raw oysters from a friends house. I was a little hesitant to try but I forced myself to taste some. The taste was good, actually, I did like it and had more than what I expected. Less than an hour and still I was in the party, I felt warm and uncomfortable. My skin started to become reddish in color, warm to touch and became itchy. Right there I knew that the oyster I consumed was my allergen. I informed my friends about it and they gave me an antihistamine tablet to ease the symptoms. They brought me to the emergency room just to make sure and in the emergency room, I was given me a shot. For a while there I became the party pooper and it was the most memorable medical condition I had. I know many people suffer from this condition and it is not rare, it can be treated. What is the Perfect Car for Your Family?